How much of the body is hollow in a semi hollow? Discussion in 'Electric Instruments' started by kmiko, Nov 8, 2018. In the semi hollow guitars, how much of the body is hollow? Pretty sure the hollow portion is visible inside the "f" hole...I'd say about the top 1/4 to 1/3 of the body...sound about right??? Yep, closer to 1/4. It's just the upper section of the round part of the body (ie. not the horn). My Artist 3s and Artist PS is WAY more hollow than that. There use to be an x ray of it, and almost every part possible is hollowed out. Thats the build with no F hole and its routed from the back, then a cap glued on. Without looking REALLY close, you would never even see the seam they did such a great job. These guitars, especially with the trems, are flat out AMAZING. My favorite semi hollow build ever. I will get a flash light and look inside my Cu22 semi hollow ltd, but I am pretty sure the upper horn is hollow, and all the way around the bottom. Hard to tell though without an x ray. That's a great pic, thanks! But I'm guessing that's of the full hollow body, not the semi? A picture like that of a semi hollow would be perfect. Anyone? Oh, you must be talking about the S2 lineup of semi-hollows, yeah? Or SEs? Or any of the Core semi-hollows, like the P245SH, special run of 408 SHs, a special run of CU24 SHs, etc. I varies a lot. Sometimes its just the upper (north of the strings) part that is hollow. In a traditionally built model with carved top, carved back and all the bracing struts and purfling, its similar to Lester Paul's log. Because the center is all solid wood. 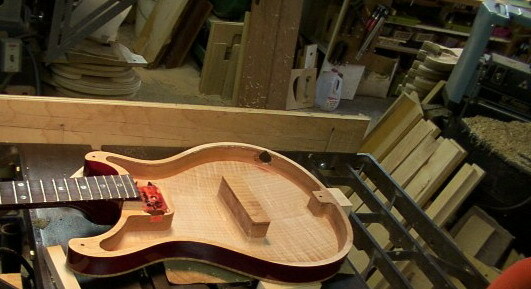 A full hollowbody archtop design tries to keep everything outside the acoustic chamber. The tailpiece, the bridge and pickups are all surface mounted. I know, but I’ve wanted to say that forever. Back in the Birds and Moons days, I built a thread for all the PRS X-rays for the various semi-hollow and hollow guitars. Would be fun to try and recreate that thread some time. Glide-bpm, bodia and Tag like this. That was the one I was talking about! Very cool pictures of some very hollow semi hollow PRSs!! This should help the OP. Glide-bpm, kmiko and sergiodeblanc like this. I’ve always been obsessed with these guitars. The idea of a semi-hollow with a trem just gets me going.